Floor Plan – Moving toilets, bathtubs or sinks makes bathroom makeovers much more expensive so try to work within the existing floor plan. Fixtures – Whether it’s footed or built-in, the bathtub is the largest fixture in the room so begin there. In general, it is very cost effective to keep your existing tub. Also, it is relatively simply and cheap to add a shower head to any bathtub that doesn’t already have one, so make sure you can always shower off after your bath. 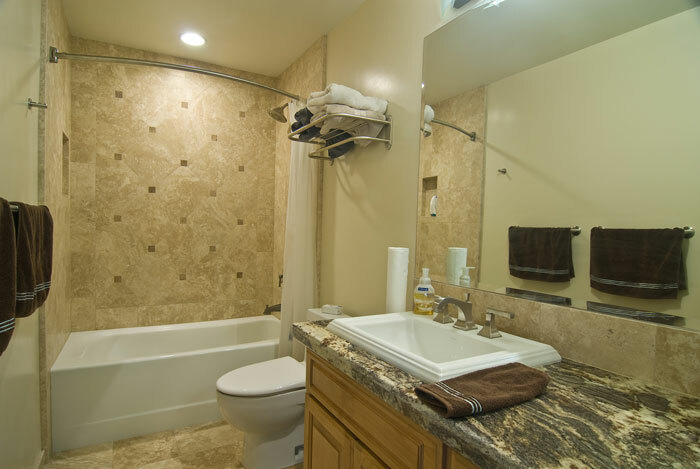 Walls – If the walls in your tub enclosure are damaged by moisture, plan to replace the old plaster or drywall with a waterproof cement and fiber mesh underlayment and then install ceramic tile on top of it. If the walls are sound and covered with ceramic tile, you can probably leave them. Plastic tile, a popular low-cost alternative to ceramic tile in the 1950s, needs to be replaced. For a quick but temporary fix you can always paint them. Flooring – A good choice for flooring is ceramic tile because it’s a durable, hard working surface that’s easy to clean. Another less expensive alternative is vinyl sheet flooring. Whatever the flooring material is, a good solid subfloor should be provided to install the new floor on. If the subfloor isn’t sound, the floor will eventually fail.